Melanie graduated from Erskine College with a BS in Biology in 1997 and received her Master of Speech Pathology from the University of South Carolina in 1999. 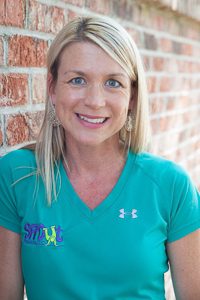 As our lead SLP Melanie has extensive experience in feeding therapy and has completed numerous oral motor and feeding conferences and is known in our area for her skills as a feeding specialist. She is trained in The Beckman Oral Motor Assessment & Intervention, Talktools Sensory Motor Approach to Feeding, as well as the Talktools Oral Placement Therapy for Speech Clarity and Feeding. Additionally, Melanie is gifted in working with clients with Down Syndrome, Childhood Apraxia of Speech and early language development. She is also trained in Prompts for Restructuring Oral Muscular Phonetic Targets (PROMPT) as well as the Kaufman Speech to Language Protocol for children with Apraxia of speech. Melanie served as a school based Speech Language Pathologist prior to joining her husband in the pediatric home based setting five years ago. While working for ten years at C.C. Pinckney Elementary on the Fort Jackson Army base, she was named Teacher of the year 2006-2007. Melanie is passionate about learning and started the Midlands SLP Think Tank for Speech Language Professionals to have an ongoing avenue to share ideas and new approaches to providing therapy. Melanie says, “I love being a part of “firsts” for so many children as they learn to speak and communicate. Seeing a child say her first word after months of hard work, or accept food from a spoon after months of oral defensiveness, pre-chaining, and food play is so rewarding!” She also shares that she truly enjoys the sense of community we have with our staff and the families we serve. Every therapist on the Sprout Pediatrics team brings unique experiences and gifts to the table and desires to know more. Sharing expertise and therapy strategies within our speech therapy team helps us positively impact more kids and families. Melanie is married to Rhyno. They have been married for 15 years and have three boys, Noah (10), Landon (9) and Bennett (4). She enjoys cycling, swimming, running and watching her boys play ball!